Today, we're visiting with Joleene Naylor. 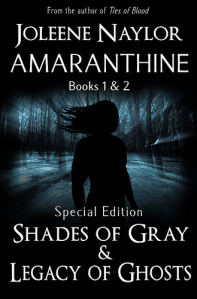 Not only is she a talented cover artist, she is also the author of the Amaranthine Series. For a limited time, Joleene is running a Special Editions promotion. Each Special Edition is on sale through January for 2.99 for the ebook versions (that’s all four books plus special features for only 6$, which is half price.) Be sure to visit the book blurbs at the bottom of the interview to learn more. Purchasing links will be provided as well. ATW: Welcome, Joleene. Can you please tell us a little about yourself? Joleene: To start with, my name has too many e’s. I believe it is this extravagance with vowels that has led me to the path of wanton excess. Okay, not really. I don’t think I’d know wanton excess if it wore purple and sat on the tv, unless you mean an excess of projects. Between writing the Amaranthine vampire series, doing freelance artwork and book covers, maintaining blogs and a website, and playing at photography, what I really have is a shortage of time. ATW: Wow. You sound incredibly busy! When did you begin writing? Joleene: I don’t remember not writing. I ‘wrote’ and illustrated my first story before I could read. A girl gets a telephone call and goes to the skating rink. I don’t remember what else happens, only that her dress is a different color on every page because I couldn’t decide what color I wanted to use. I guess you could say I got serious about writing when I was in high school. Joleene: In October I released the Amaranthine Special Editions, which are each two books in one and include a lot of bonus features, like character artwork, interviews and extra stories. Special Edition I includes Shades of Gray and Legacy of Ghosts, while Special Edition II contains Ties of Blood and Ashes of Deceit. ATW: What book are you working on now? Joleene: Heart of the raven, book 5 in the Amaranthine series. It was supposed to be a December or January release, but “real life” got in the way. It picks up where Ashes of Deceit left off and sees Katelina and her vampire lover Jorick sent to Munich, Germany to testify before the True Council, the head of all vampires in the world. Of course, nothing is ever straight forward or easy for them, and they deviate in search of an ancient artifact that could cause a lot of chaos if it fell into the wrong hands. ATW: What is the most challenging aspect of writing your novels? Joleene: Making myself *write*. There are so many distractions now: facebook, twitter, blogs, websites – all those author promotions we all “must” do in order to be “successful”. ATW: Of all your characters, which one is your favorite? Why? Joleene: Verchiel is one of my favorites because he writes himself, so while he’s in center stage I get to relax and just let him go. Micah is the same way and, truth be told, I think they have more in common than they’d ever admit. ATW: Which character is the most challenging to write? Joleene: In Heart of the Raven it’s Sadihra/Zadihra (she may get a name change) because I just can’t connect to her for some reason. We need to sit down and have a long chat. Joleene: I think vampire offer the most freedom. They can be anything, from any era. They can be sciency, they can have fantasy elements, such as “super powers”. They can be heroes or villains. They can be romantic or loners. They can save the world, or they can simply complain about modern humans need to be “connected” 24/7. They’re a good platform for a lot of societal commentary that gets chalked up to “Oh well, he’s an old fashioned vampire, what do you expect?” Plus, vampires are just really hot. ATW: If your book was ever made into a movie, which actors and actresses would you cast? Joleene: I actually imagine it as an anime. I’ve always loved animation and someday I may learn to do it. Maybe I’ll animate it myself if no one else offers. ATW: How do you handle unfavorable reviews? Joleene: Most authors say to ignore them, but the truth is that this is impossible. Rather than giving you the “publicly acceptable” answer, I am going to do something scary and tell the truth! The first thing I do is get incensed. “How dare they not like my work?” Then, after I calm down, I read it over and over, until there is no more sting in the review. A that point I analyze whether their complaints are valid. By this I mean “the plot was hard to follow” vs “this book was too short for free” (I actually get the second one. Those I ignore because the book description starts with the words: Short. 8,000 words.) If the complaint is genuine, then I try to apply that in future works. ATW: If you were stranded on a desert island and could only have five books with you, which books would you choose? Joleene: I’m going to cheat a little. The Complete Edgar Allan Poe (lots of short stories), The Faun and the Woodcutter's Daughter by Barbara Leonie Picard (lots more short stories), the one volume edition of Lord of the Rings by J.R.R. Tolkien (three books in one! ), The Dollhouse Book by Stephanie Finnegan (I love to look at the pictures), and then I would super cheat and sew The Hobbit and The Silmarillion together into one book. ATW: What songs/artists are on the playlist for your book? Joleene: HIM & The Rasmus are the usual suspects, but it depends on my mood. ATW: What advice would you offer to new or aspiring authors? Joleene: If you want to indy publish, do it soon. I know a lot of people are predicting that indy publishing will continue to grow and grow, but I don’t think so. It’s a frontier, and no frontier lasts forever. Eventually civilization comes along – all the gold miners and cowboys get married. Doilies and china tea sets replace the rough and rugged furnishings (we’re already seeing that) and eventually the “laws” start. You can’t do this, you can’t do that, and pretty soon we’ll all need permission to publish from the gate keepers. It will start small; just editing and grammar and punctuation so that only “polished books” can make it, and eventually it will be the same racket the traditional publishers run now, where they only approve the “sale-able” stories. Only, while the traditional publishers at least admit it, the new gatekeepers will claim it’s a “quality issue” for “the good of all” to “eliminate the bad books”. As Mark Coker says, bad books eliminate themselves when no one buys them, but in a society of people who like to be told what restaurant to go to rather then decide for themselves, I think we’ll soon be back to someone telling us what we want to read. I think I’m channeling Jorick, here. Shades of Gray: Hunted by a coven of vampires, Katelina has only one person she can trust: Jorick. But when her knight in shining armor turns out to be one of the monsters she has to examine her perceptions of good and evil to survive. Legacy of Ghosts: For Katelina and Jorick, peace is hard to come by. Kateesha plans to fight the same battle as Jorick’s fledgling, but a common enemy isn’t enough to overcome previous betrayals. Drawn into a deathly conflict, Jorick and Katelina must let go of old regrets, or lose their future to the ghosts of their past. What’s a special edition without special features? Includes the “Lost Chapters” from Legacy of Ghosts, the short story “How to Silence a Human”, links to downloadable content and a character gallery featuring original artwork. Why should DVDs have all the fun? Ties of Blood: A trip to Katelina’s home starts a chain reaction; she and Jorick meet Verchiel, a too friendly vampire, then the police arrest Jorick for kidnapping. Worse, The Guild wants to question them. Will Malick, the head of the vampires, punish them? Or will the mysterious vampire following them do the job first? Ashes of Deceit: Katelina and Jorick must rescue a captured vampire and discover who really took him. The truth isn’t easy to find. As Oren’s attack on the Guild draws closer, Jorick and Katelina are led back to the Citadel. When the flames of war ignite, can they rise from the ashes, or will they be consumed? What’s a special edition without special features? Includes character interviews, the story of Lilith, links to downloadable content and an Executioner gallery featuring bios and original artwork. Why should DVDs have all the fun? Thank you for visiting with us. I really enjoyed having you and hope you'll come back soon! Thanks, Juli. Looking forward to visiting with you soon! Excellent interview, Tricia, as always. I love Joleene's Amaranthine Series and can't wait for her next book. Thanks, Donna and Roger, for stopping by.